SeaWorld Orlando's Park Officials say that Johnny, the 24-year-old polar bear, died unexpectedly Thursday. 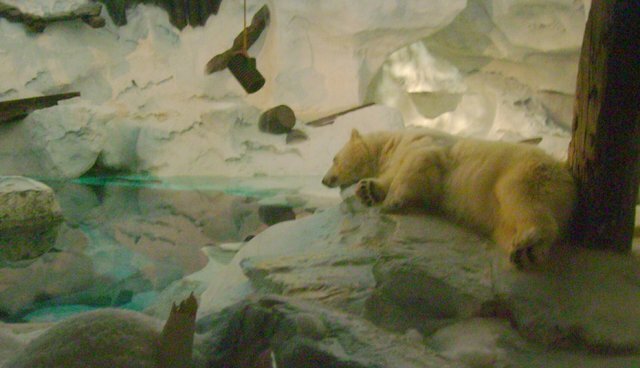 Johnny had lived in captivity at the themepark for 19 years, but was soon moved to the new Wild Arctic Exhibit with a few other Polar Bears. Klondike, an 18-year old Polar Bear, died last September. Local News in Florida claim he's the last Polar Bear. According to National Geographic, the average lifespan of their wild counterparts live to be 25 - 30 years. It is not uncommon that animals' lifespan are cut in half, or even a quarter, in captivity; due to the stress, heat and unadaptable exhibits. "Johnny was part of our family, team members are feeling the loss, in much the same way a family does when they lose their pet. Johnny enhanced the awareness of polar bears to millions and millions of SeaWorld Orlando fans and visitors - he'll be missed by our guests and team members", said Mark Boos, SeaWorld Orlando vice president of zoological operations in an interview. Johnny went in for a physical examination Thursday Morning; SeaWorld's attending vets state that Johnny had several age-related conditions (According to WJXT Jacksonville, he suffered lameness and a minor skin condition), but that there were no problems when the animal went under anesthesia. They believe that he may have suffered a cardiac arrest during the recovery. A Seaworld Official said that the death was unexpected; SeaWorld says they plan to do a necropsy on Johnny to find out the cause of death. Results will come in within 6 - 8 weeks.